from 60 pcs. 0.29 CHF ea. from 140 pcs. 0.27 CHF ea. from 360 pcs. 0.24 CHF ea. The convenient solution if you want to glue on a disc magnet. 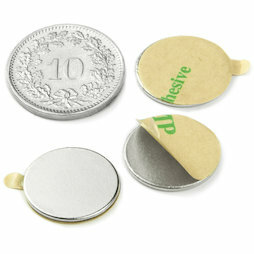 It is a very flat disc magnet (15 mm diameter, 1 mm thin) with a self-adhesive side. Just remove the film, stick it on and done. Your smart mailing or creative arts and crafts project is ready. With the S-15-01-STIC you can also hang up photos or office utensils without making holes in them. 20 pcs. 0.49 CHF ea. The S-15-01-STIC is also suitable for creating large mailings or press kits: Glue a magnet on one side. If you use business cards as name tags, we recommend the PET card holder in business card format.